ORGANIZED 108(78) E. 13th St. PRESENT QUARTERS 108 E. 13th St. There is a price to helping to heal the world’s pain. You relive that pain when, in thanking you, people tell you stories of exactly what losses you’ve helped them overcome. That’s especially true if, like Darlene Racicot who created an ice sculpture of an angel comforting an exhausted New York firefighter holding the American flag post Sept. 11, you have the imagination and compassion to put yourself in their shoes. "We were only imagining what their pain was like before," Racicot said Monday. "Now we’ve heard from the families, ordinary people like us, who were left behind. There’s a lot of pain and I’m certainly feeling it now." After receiving hundreds of e-mails from people around the world, including many touched directly by the tragedy, Racicot and her husband Rick know in detail the dimensions of the loss she tried to console, through her choice of sculpture for the recent South Porcupine-Porcupine Winter Carnival. Working steadily at replying to the outpouring of emotion, in the three days since the Daily Press covered the beginning of the phenomena and published her e-mail address with her permission, Racicot has been left sleepless and wrung out. "Some I can just send a brief thank you to," she explained. "To others you have to say more—their stories bring tears to your eyes. You have to think of what to say in response to things like that. "They all say 'thank you,' say how the image helped them to heal and they say it so beautifully." As much as that’s appreciated by Racicot, it tears her heart and her empathic nature. She has replied to hundreds of e-mails already, with hundreds to go, while people are cued up on the Internet to get through to her. Rick estimates another 70 e-mails came in Monday by 5 p.m. The backlog grows despite his wife wearing herself thin to reply to them all. People may have to expect longer waits for replies as her family insists she take care of herself first. Another thing straining Racicot’s tear ducts is the enormity of the praise she is receiving. "I’m so overwhelmed," she said. 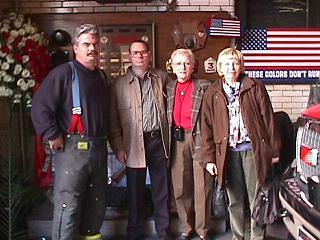 "One e-mail read, 'Many people came to our aid, but you helped us rise above it.' To me it’s a bit much—I’m just me. I don’t feel deserving— there are others that gave so much more." Regardless, as Susan Blanch, producer with news radio station WCCO in Minneapolis, Minn., told Racicot, "You don’t have any idea the impact you’ve made here." Blanch has arranged an interview with Racicot on their Tim Russell Show at 10:40 a.m. today and was impressed with the South Porcupine resident’s compassion in their first phone contact. "She started crying as we talked about people’s reactions and I’m going to start crying just thinking about it," Blanch said, Monday. "It was so sweet—she’s such a neat lady." 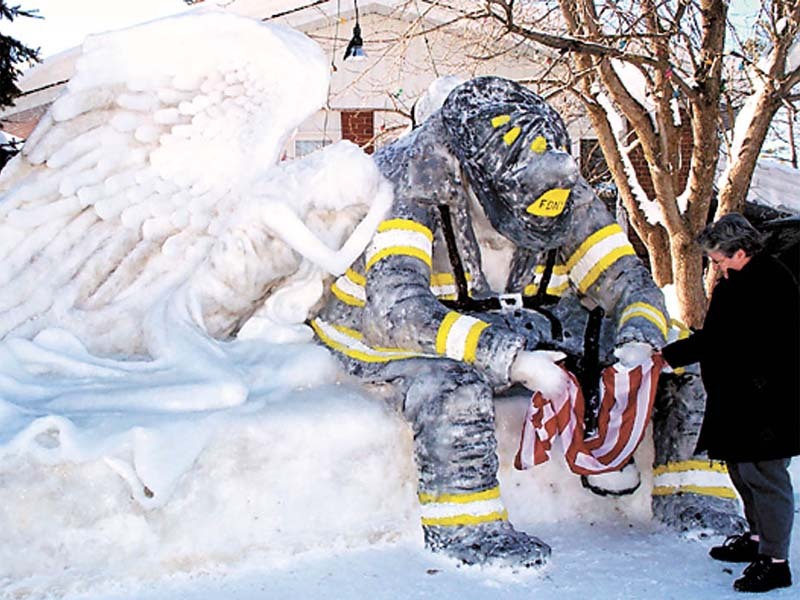 In another display of character, Racicot gave Blanch the number of the artist whose painting of two smaller angels kneeling at the firefighter’s knees, had been digitally modified to a new pose in the e-mailed image Racicot based her sculpture on. The artist, Gray Lineback (dline49492@skybest.com) also contacted Racicot along with people from Australia, Sweden, England, Japan, Israel as well as from across Canada and the United States. Racicot hopes Lineback will be interviewed at the same time, in a conference call. The second, supercharged stage of Racicot’s fame began at 7 a.m. Saturday, shortly after the Daily Press hit the stands. Her husband handed her the paper and the phone at the same time, before she was fully awake. "This amazing lady, a poet from New Mexico with her own Web site, was screaming excitedly on the phone, 'I’ve found you! I’ve found you!'" Known online as Sky, she wanted permission to start pages on Racicot’s sculpture, titled From Fire to Ice . The results can be seen online at skyangel@goldenmoon.org [http://www.goldenmoon.org/~skyangel/fire_ice3/fire_ice3.html: no longer up]. They include the text of Saturday’s Daily Press article, phone and e-mail conversations with Racicot on topics like construction techniques and additional images with people to give a sense of the sculpture large scale, which shocked Sky. The site closes with the type of words Racicot has difficulty associating with herself, but represent American feelings nonetheless. "I know all our hearts have been touched by an angel—Darlene, you are that angel, Sky." "She’s on a mission," Racicot said. "She said, 'I’ll leave no stone unturned until everyone in the world has seen this picture.' There’s a button on one page for people who want to e-mail me." Sky will have lots of help in spreading the image. Racicot has responded to a steady stream of e-mails requesting permission to post the image and others saying it’s already done. The sculpture image is also on www.firehouse.com, and can be downloaded from the Daily Press site as "wallpaper," for computer desktops. Racicot places no limit on postings, but is absolutely firm that any money made from the image will go to Sept. 11 relief. A company contacted her Monday for permission to produce lapel pins with the image. Racicot is putting all licensing decisions on hold, until she can turn them over to trusted relatives in western Canada who have experience in charitable licensing. Racicot is still trying to take it all in. "Susan (Blanch) told me it’s because North Americans hear of bombings overseas, but don’t really associate it with home. There are no monuments to those kinds of occurrences and mine is the first." "I am the flag," an online tribute to the American flag, complete with images of it being raised on the moon, Iwo Jima and Ground Zero. The site now ends with Racicot’s sculpture. Between a waving American and Canadian flag, is a message reading "America thanks you. You have touched our hearts. Sculpture created by Darlene Racicot, Timmins, Ontario, Canada." "I saw that and said, 'My God! That’s our flag up their beside theirs, on a Web page dedicated to the American flag,'" said a touched and overwhelmed Racicot. "It’s a little too much for me," she said of the licensing requests and the e-mails that demand an answer through their poignancy. "Everything is coming a bit too fast."